I am having a little trouble. Recently I bought an ASUS router which has the OpenVPN built into it. I have setup the VPN server and installed the OpenVPN app on my iPhone and I would like to be able to force my household to use the VPN when outside of the house for security and filtering. It works... Sort of. They currently can turn off the VPN and it shuts off here and there. I read the iPhone had an always on VPN option but I don't not see anything. Can any of you assist or ran into anything similar? Re: OpenVPN iOS "Always On"
In the general settings on iPhone under openVPN it has which I think you are looking for! Hope that helps. I navigated to this setting page but I am not presented with any options - it is a blank white page. Where are my setting options? cvillard wrote: I read the iPhone had an always on VPN option but I don't not see anything. Can any of you assist or ran into anything similar? That "AlwaysOn" feature in iOS doesn't apply to OpenVPN. You can achieve similar with OnDemand VPN. Google may help with you on details. Have you tried setting connection timeout to "Never"? Does anyone know what "Never" means in this case? Any word on this from the OpenVPN developers? I am aware of the fact that iOS/Apple at this point only supports an always on VPN on supervised devices and only with an IKEv2 based VPN solution, but I should think OpenVPN is the player on the market to get this one fixed for themselves too. 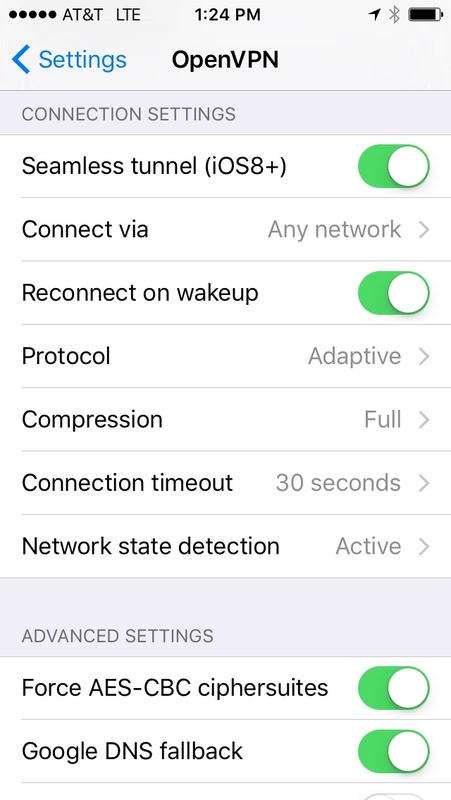 We also have problems with devices that always need an active tunnel; but when the iOS devices go in lockscreen the tunnel stalls en gets in to "sleep mode", which basically means a drop of IP-adress and no traffic. Is there anything OpenVPN can do? Hi James, thanks for your quick reply. On-demand is very useful indeed but for scenario's where a constant data stream is needed on iOS, it is not enough. When the device goes into sleep mode the connection is reset after 30 secs. When the device becomes active again the on-demand kicks in and there is connection again. Is a real "always on" function something you guys could get to work on iOS in cooperation with Apple? Or are you even planning to do so? Cheers! The "Seamless Tunnel" setting is as close as we can get to being "Always on". Anything beyond that would need support from Apple in the iOS VPN API. James, thanks, I understand. What do you think the chances are for Apples support on this feature? Would that be a possibility to explore? I use OoenVPN to access my home network and Cisco AnyConnect to access my work network. Both work GREAT from my iPhone (6s+/IOS10) and Surface Book (Windows 10). On my Surface when I use either OpenVPN or AnyConnect the tunnels stay up basically forever - even if there aren't any packets traversing the tunnels. Only time they go down is when I shutdown or hibernate my PC or the PCs Internet connection breaks. On my iPhone if I make an AnyConnect tunnel to work it stays up forever. Even if no apps are using the tunnel AND I can lock my iPhone and AnyConnect keeps the tunnel up in the background. It works EXACTLY like it does on my laptop. In fact AnyConnect has stayed connected over night with no issues!! BUT - OpenVPN disconnects the tunnel Within 30 seconds of my phone locking. I can't find any settings that will make my OpenVPN Tunnel persistent. So my question is this - IF Cisco can make their tunnel persistent while living under Apples rules - why can't OpenVPN work the same way ? ?